This can also be made in a bowl with a whisk but a clean jam jar is excellent for storage. Makes about 100 ml or 3 1/2 fl oz. This can also be made in a bowl with a whisk but I find a clean jam jar an excellent for storage. Place the lemon juice in a screw-topped jar, add the sugar and a good pinch of salt, then shake until the salt has dissolved. 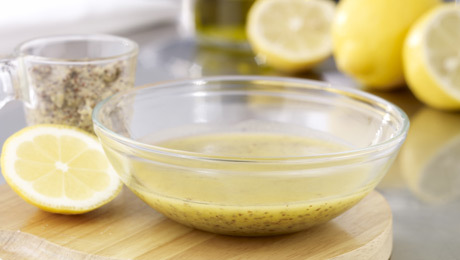 Add the oil and mustard to the jar and shake again until you have formed a thick emulsion. Season to taste and chill until needed.